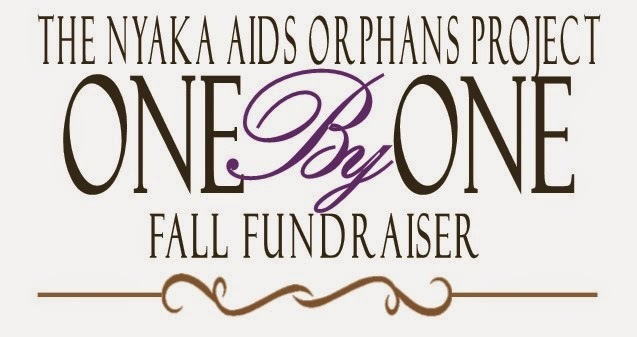 I have been the Development Coordinator for the Nyaka AIDS Orphans Project for just over a year now. I just returned from my first visit to our operations in Uganda a week ago. I spent about three weeks seeing the schools, the clinic, meeting the people whose lives you are transforming every day. My mother told me that I would be changed by this trip and I really just shrugged that off because...well, I travel. I've been to developing countries before. I've worked with people living in poverty. I've spent the previous year telling other people about Uganda. So I thought I knew everything (which, in general, I do). Believe me when I tell you that my world was shattered...in the best way possible. The people that I met there and the experiences that I had will stay with me for the rest of my life. I met grandmothers like Furida-- A woman YOU saved from homelessness! The day I met Furida was the day that the true impact of what Nyaka does truly hit me. Furida is the sweetest, most loving person I've ever met and she's all alone. 13 of her 15 children have died. The grandson she raised for 8 years died from HIV/AIDS, and her granddaughter ran away to find work. What Furida has survived broke my heart. She had every reason to be bitter about life but she chooses to be grateful for the blessings she has. She showed me her new house and new kitchen. She is so proud of what Nyaka has done for her. And she considers her Nyaka family to be like a child to her. Even though you've never met, you have a mother in Uganda who loves you and prays for you. Furida's going to be featured in our Ten Weeks of Stories. You can subscribe to our newsletters if you haven't already to get her story delivered right to your inbox! These are some of the nursery students at Nyaka Primary School. Kutamba students love to have their photo taken. I mean LOVE it. If you visit, bring a big memory card for your camera and be ready to see a few hundred adorable faces all ready for their close ups. Nyaka students are some of the best players I've ever seen. Getting these students to stop for a second for a photo was magical. These Kutamba nursery and primary 1 students are giving you flowers. This is something your students do when they want to give someone praise for something. "Our donors are amazing, let's all give them flowers!" I didn't see this picture until I got back to the States. Don't they just melt your heart? One of the children I met was a little girl named Mable (who you're also going to see featured in our Ten Weeks of Stories). She's a sweet Kutamba nursery student of about 6 years old. Like the majority of your students, she's a double orphan. She walks miles to school. Despite the hardship I know she's had to face, she's full of joy. All of your children are. They have no problem focusing on the good in their lives. The people I met are so happy for what they have, that it can be easy to miss some of the big problems. It was a while before I realized that the children I saw playing in the middle of the day--though adorable--reveal a sad truth. 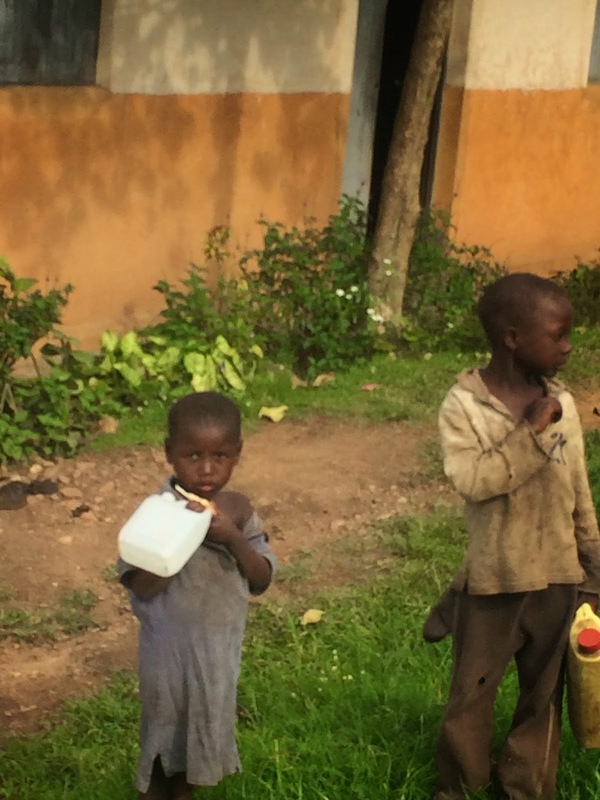 Many children in Uganda aren't in school. And the even sadder truth is, without a miracle, they're not likely to be anytime soon. And, even though we were able to help many of our grandmothers, there are many more who desperately need our help. When I finally got a moment to catch my breath, I sat down to think about my trip--to process everything I had seen. I didn't just think about the children and the grandmothers. I thought about the ones who have been taken by the HIV/AIDS epidemic. I imagined myself in their place. I thought of my own grandmothers and my two adorable nieces. If something terrible had happened and they were left all alone, I would want someone to be there. I would want someone to love and care for them as I no longer could. Obviously, no one can replace a parent or a child, but I realized that everyone can show love. Everyone can choose to change a life. I've decided to help. I went all the way to Uganda but YOU can make a difference with the click of a button! Making a gift today will help us ensure that your children and grandmothers are taken care of. As little as $21 a month sponsors a primary student's education. Or just $62 a month will build a house for a grandmother like Furida (over 1 year). Posted by Daniele Reisbig, Development Coordinator for the Nyaka AIDS Orphans Project if you have any questions for Daniele, you can reach her at daniele@nyakaschool.org or at the US Nyaka offices at (517) 575-6623. Meet Our Young Hero, Cameron Northern! Cameron Northern has been a champion for Nyaka since she was 7 years old. She was introduced to Nyaka when T. Jackson Kaguri came to speak at her church. After he told her about the children he was helping in Uganda, her heart was changed and she wanted to do something. Cameron asked her mother if she could give her piggy bank to Nyaka. She donated everything she had to the children. But even that didn't feel like enough. Cameron hand wrote letters to all of her friends and family asking them to send her their change. The response was tremendous and she raised $848.48 for Nyaka! Cameron and her family were excited for the success of their campaign but she felt in her heart that God wanted her to continue helping Nyaka. Since that year Cameron, with the help of her parents, Seth and Ali, and her little brother, Brett, has planned a fundraiser to support Nyaka every year. Cameron's father, Seth, told us that she has no problem asking people for money because she loves this organization so much and has such a passion to help. The real challenge is coming up with something new every year. And she's done a fantastic job! From a school supply drive and collected 250 pounds of school supplies to selling flower pins they made in their kitchen (raising $750! ), she's worked hard to do whatever she can to help your children and grandmothers. Cameron told us "I always want to do something different than I did the year before. I like to be creative and I think that creativity helps when you fundraise. I’m just really excited to do this." 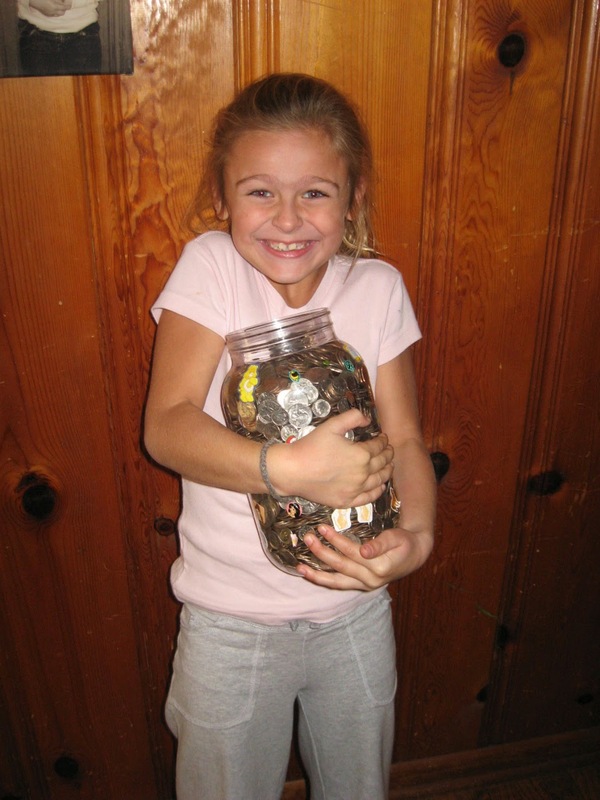 Apparently her excitement is contagious because this year Cameron raised her biggest total yet! She entered an indoor triathlon that included swimming ¼ mile, biking 10 miles, and running a 5K. Cameron hand wrote letters to her friends and family asking for their support. On the day of the event everyone came to cheer her on. She did the whole thing in 1.5 hours! AND she raised $2,603 for your students! Cameron's mother said, "This is all Cameron’s heart and soul. Seth and I are just behind her to support her." I am completely committed to helping these children. I have realized how fortunate I am and how much I have that these children do not. I realized that the pink bike I wanted was DEFINITELY not as important as a little kid on the other side of the world going to school and having food. I have also learned so much through the process of raising money for Nyaka. First, if you are passionate about something, tell others about it! Live and breathe it! Figure out a plan to help the organization you are passionate about and just do it! Second, don’t be afraid to ask others to support you. People have been so generous in supporting me and even telling me that they were so glad that I asked them! I was amazed how my letters touched peoples’ hearts, and it was humbling to have them tell me that they were proud of me. Third, I learned that being creative helps your fundraising effort. Every year I try to switch things up a bit and do something different which people seem to like and I can reach a broader range of people. Lastly, I have also learned to have confidence in myself. I’m not embarrassed or afraid to ask people to help Last year at church camp I even to stood up in front of a group of youth, told my story and encouraged them to support and fundraise for organizations that mean something to them. Nyaka has named me one of their “Young Heroes and Child Ambassadors”. I’m working with them and my parents to come up with new ways to teach and encourage children to give. Most importantly, all of this fundraising has taught me that even a young child like me can make a difference in the lives of people half-way around the world! All you have to do is ask and put in the hard work! We hope that Cameron inspires you as much as she has us! Cameron is currently in the planning stages for her most ambitious endeavor yet. We won't spoil the surprise but we're really excited to see what this amazing girl does next! Want to meet Cameron and her family in person? Bloomington, Indiana on November 1st! Email us at info@nyakaschool.org to find out more!